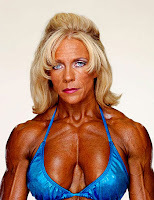 Alright - let me "pose" the question (pardon the pun)... do you find this attractive or repulsive? If all the surveys on this topic are to be analyzed appropriately, the answer is that there will be people supporting both the affirmative and the negative. For me, I have some trouble reconciling the pictures in my mind. 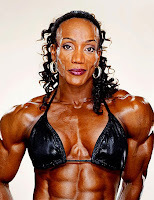 Women body builders are so masculine in their appearance that it is just confusing. Thanks to Martin Schoeller (photographer), I am able to post a selection of pictures from his latest book. Please - only look if you are one that is not repulsed. 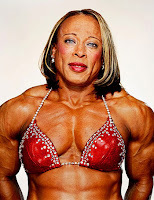 I think from a 'awe' perspective, female bodybuilders are even more startling than their male counterparts. Why? - Because they seem to take you by surprise... Although many a body building fan would say they are attracted to them, there are many 'non-fans' who really will and do admit revulsion. Make up your own mind!! - You can pick up a copy of Scoeller's book at Pond Press or Amazon (if you want a real talking point on your coffee table). I think it is gross but I do however admire their ambition and motivation. I THINK THEIR BEAUTIFUL THEIR PERFECT BODY REALL SHOW THEIR GREAT DEDICATION TOWARDS THEIR PROFESSION.